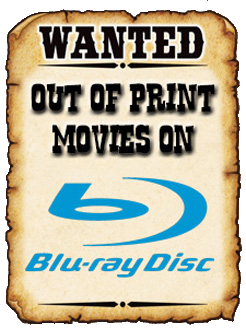 THE B-MOVIE NEWS VAULT: Be careful what you wish for! Vestron Collector's Series delivers the WISHMASTER films in new limited edition set! Be careful what you wish for! 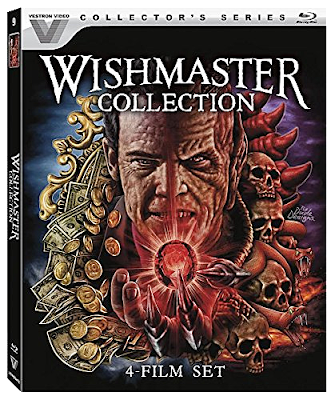 Vestron Collector's Series delivers the WISHMASTER films in new limited edition set! OWN ALL FOUR "WISHMASTER" FILMS IN THIS NEW BOXSET FROM LIONSGATE'S VESTRON VIDEO COLLECTOR'S SERIES! 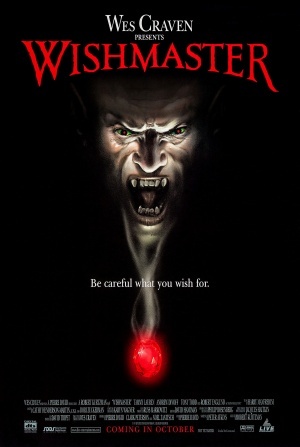 I think the original WISHMASTER is a really solid piece of genre filmmaking and deserves plenty of love. The sequels? Truthfully, I cannot comment further because I've never really seen the rest. Regardless, this set is extremely tempting, and is a great bargain considering it is the first Vestron title that is reasonably priced! Synopsis: Magically powerful. Supernaturally evil. The ancient entity known in human legend as the Djinn can grant a person's wildest dreams. And in the process, it unleashes your darkest nightmares. The moral of the explosively terrifying, special-effects-powered, horror-fantasy spectacular: Be careful what you wish for! Audio commentary with Director Robert Kurtzman and screenwriter Peter Atkins. Audio commentary Director Robert Kurtzman and stars Andrew Divoff and Tammy Lauren. Isolated Score Selections/Audio Interview with composer Harry Manfredini. Out of the Bottle - Interviews with director Robert Kurtzman and co-producer David Tripet. The Magic Words – An Interview with screenwriter Peter Atkins. The Djinn and Alexandra – Interviews with stars Andrew Divoff and Tammy Lauren. 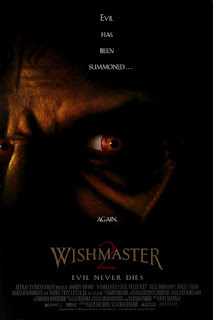 Wish List – Interviews with actors Kane Hodder and Ted Raimi. Synopsis: When the legendary monster, the Djinn, is re-released, he begins his reign of terror, plunging the earth into horror and chaos. As the Dijnn reaches his goal of a thousand captured souls, it is up to Morgana to stand between the world as we know it and a terrifying future beyond our darkest fears. Audio Commentary with writer/director Jack Sholder. 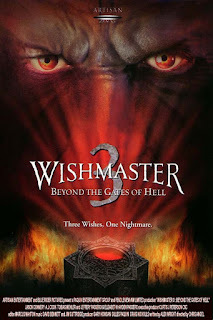 Synopsis: Horror goes to extremes with WISHMASTER 3: BEYOND THE GATES OF HELL, the goriest installment of the hit franchise yet. When Diana, a beautiful coed, discovers an ancient gem inside a mystical Persian case, she unwittingly releases the mercilessly evil "Djinn." The gut-slinging demon uses fiendish trickery to take the form of a professor in order to slice, dice and burn his way through the university staff and its students. If he can overpower Diana, his "waker," and grant her three sick and twisted wishes, the very gates of Hell will open up and engulf the world in eternal damnation. With help from the man she loves she must impale the bloodthirsty demon with a sword from Heaven to save herself and the entire world. Audio Commentary with director Chris Angel and cast members John Novak, Jason Connery, and Louisette Geiss. 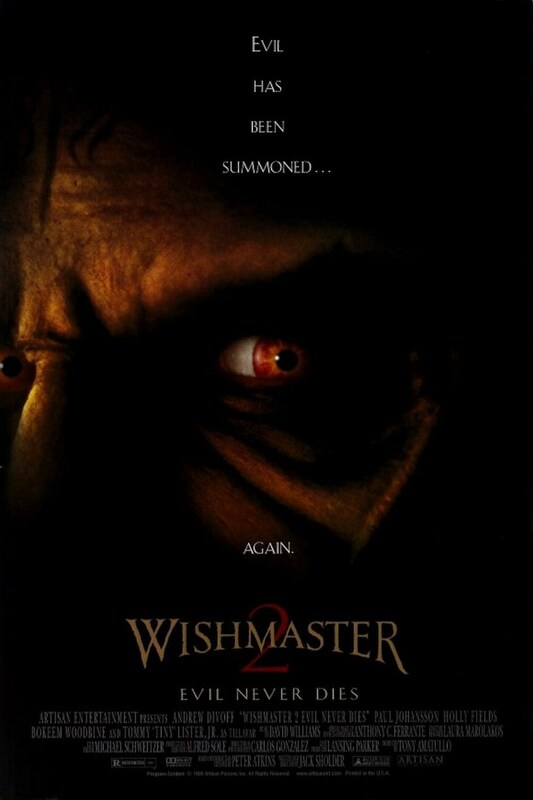 Synopsis: The unspeakable evil of the soul-devouring Djinn rises again in this fourth electrifying installment of the unstoppable WISHMASTER horror legacy! 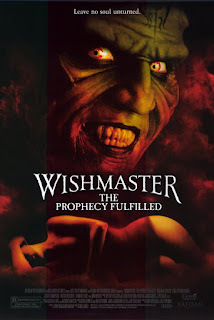 But now, as a host of new victims see their most nightmarish wishes come true, the world faces the ultimate demonic terror; an onslaught of multiple Djinns hell-bent on destroying everything in their path! 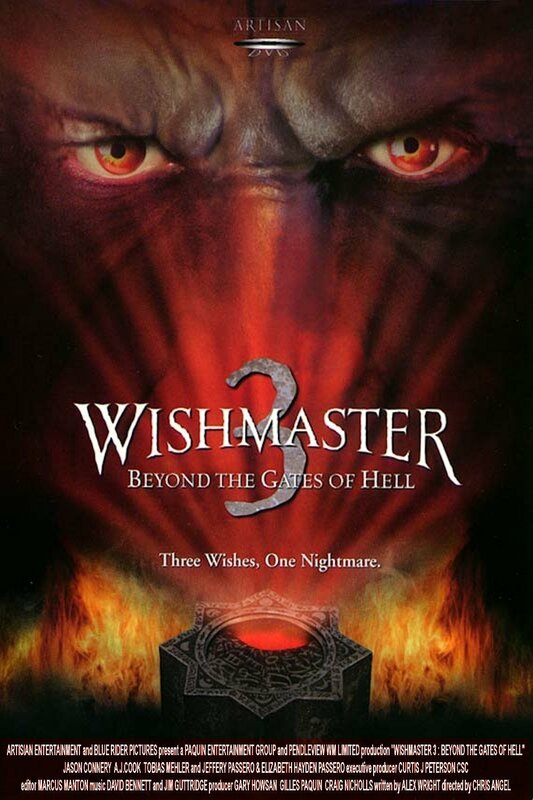 Audio commentary with Director Chris Angel and cast members Michael Trucco and Jason Thompson. Audio commentary with Director Chris Angel and actor John Novak. The WISHMASTER COLLECTION is currently available wherever Blu-ray discs are sold! You can order it today (for around forty bucks) from AMAZON, BULLMOOSE, or DIABOLIK DVD! Never seen any of these films? Then check out the trailer below and sample this murderous "genie" franchise before you buy!